The first premise states that all objects classified as "men" have the attribute "mortal". The second premise states that "Socrates" is classified as a man  a member of the set "men". The conclusion states that "Socrates" must be mortal because he inherits this attribute from his classification as a man. 1. The conclusion does not contain the middle term. 1. All men are girls. 2. Some girls are students. 1. All girls are men. 2. Some girls are not students. Since both the conclusions 1 and 2 contain the middle term 'girls', so neither of them can follow. 2. No term can be distributed in the conclusion unless it is distributed in the premises. 1. Some dogs are goats. 2. All goats are cows. 1. All cows are goats. 2. Some dogs are cows. Statement 1 is an I-type proposition which distributes neither the subject nor the predicate. Statement 2 is an A type proposition which distributes the subject i.e. 'goats' only. Conclusion 1 is an A-type proposition which distributes the subject 'cow' only since the term 'cows' is distributed in conclusion 1 without being distributed in the premises, so conclusion 1 cannot follow. 3. The middle term (M) should he distributed at least once in the premises. Otherwise, the conclusion cannot follow. For the middle term to be distributed in a premise. (i) M must be the subject if premise is an A proposition. (ii) M must be subject or predicate if premise is an E proposition. (iii) M must be predicate if premise is an O proposition. Note that in an I proposition, which distributes neither the subject nor the predicate, the middle term cannot be distributed. 1. All fans are watches. 2. Some watches are black. 1. All watches are fans. 2. Some fans are black. In the premises, the middle term is 'watches'. Clearly, it is not distributed in the first premise which is an A proposition as it does not form its subject. Also, it is not distributed in the second premise which is an I proposition. Since the middle term is not distributed even once in the premises, so no conclusion follows. 2. Some pens are erasers. 1. All books are erasers. 2. Some erasers are books. Since both the premises are particular, so no definite conclusion follows. (b) if both the premises are negative. 1. No flower is mango. 2. No mango is cherry. 1. No flower is cherry. 2. Some cherries are mangoes. Since both the premises are negative, neither conclusion follows. (c) if the major premise is particular and the minor premise is negative. 1. Some dogs are bulls. 2. No tigers are dogs. 1. No dogs are tigers. 2. Some bulls are tigers. Here, the first premise containing the middle term 'dogs' as the subject is the major premise and the second premise containing the middle term 'dogs' as the predicate is the minor premise. Since the major premise is particular and the minor premise is negative, so no conclusion follows. 5. If the middle term is distributed twice, the conclusion cannot be universal. 1. All fans are chairs. 2. No tables are fans. 1. No tables are chairs. 2. Some tables are chairs. Here, the first premise is an A proposition and so, the middle term 'fans' forming the subject is distributed. The second premise is an E proposition and so, the middle term 'fans' forming the predicate is distributed. Since the middle term is distributed twice, so the conclusion cannot be universal. 6. If one premise is negative, the conclusion must be negative. 1. All grasses are trees. 2. No tree is shrub. 1. No grasses are shrubs. 2. Some shrubs are grasses. Since one premise is negative, the conclusion must be negative. So, conclusion 2 cannot follow. 1. Some boys are thieves. 2. All thieves are dacoits. 1. Some boys are dacoits. 2. All dacoits are boys. Since one premise is particular, the conclusion must be particular. So, conclusion 2 cannot follow. 8. If both the premises are affirmative, the conclusion must be affirmative. 1. All women are mothers. 2. All mothers are sisters. 1. All women are sisters. 2. Some women are not sisters. Since both the premises are affirmative, the conclusion must be affirmative. So, conclusion 2 cannot follow. 9. If both the premises are universal, the conclusion must be universal. Find out which of the conclusions logically follow from the given premises, More than one conclusion may also follow. In such questions, first the given statements are analysed. If the middle term is not disturbed even once, no conclusion follows. Thus the middle term must be distributed at least once. To derive the correct conclusions, we usually take the help of the Venn Diagram. 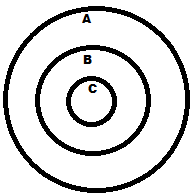 For the given statements, the Venn Diagram is as shown where B indicates books, C indicates cakes and A indicates apples. Now, since B has a common area with C, so 1 follows while 2 does not. Also, B has a common area with A but does not entirely lie with A. So 3 follows while 4 does not. Thus, only I and III follow. Hence, the answer is (c).